Chronic pain is a debilitating physical condition that can last a lifetime. Because it is not widely discussed by institutions, nor is it extensively covered by the media, the general public is not well-oriented with the issue of chronic pain, despite the extenuating condition that it is. Daniel’s mission in doing this trip is to fight this, and to let spread awareness among his countrymen of the true state of chronic pain. Chronic pain is pain that persists over three months, beyond when an injury should have healed. Chronic pain can be intermittent (occurs in a pattern) or persistent (lasting more than 12 hours daily) and can be considered a disease itself. 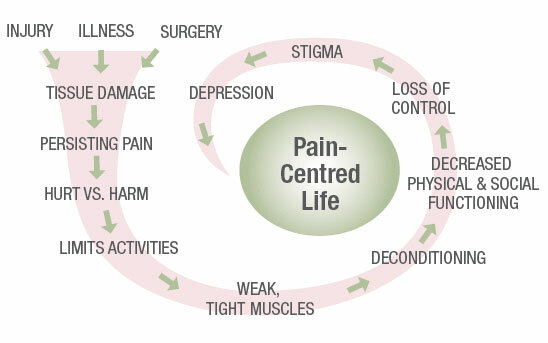 It is important to understand that chronic pain is not just a continuation of acute pain. Unlike acute pain, which alerts your body to injury, chronic pain serves no purpose. Although chronic pain can result from acute pain if left untreated, such as after surgery, the most common causes are osteoarthritis and low back pain. Another type of chronic pain is called neuropathic pain which results from disease or injury to the nervous system. Many common diseases can result in changes in our nervous systems that cause pain. Shingles, diabetes, and stroke are common examples. Chronic pain disrupts your life, lessens your ability to handle stress, weakens your immune system, and can result in anxiety, anger, and depression. Depression is one of the most common problems experienced by people with chronic pain. If pain results in a loss of independence or mobility that decreases an individual’s participation in social activities, the risk of depression significantly increases. Social Isolation – Some people with chronic pain may lose their friends, strain their family relationships and wear down social supports. With this loss of community comes a loss of interaction and engagement with people or activities that previously helped them cope with their pain. Psychological Shifts – A person’s mental health and overall attitude toward life can greatly affect their pain experience. For example, research has shown that for people with low back pain, feelings of helplessness, fear and a ‘glass-half-empty’ perspective are linked to poorer health outcomes. Conversely, those with a strong sense of psychological wellbeing and a more positive outlook on life tend to cope better with chronic pain. Work/Career Shifts – Some people with chronic pain struggle to keep their jobs. Sometimes the challenge is convincing employers to let affected employees modify their jobs or their workloads so that they can manage their pain while continuing to work. Research has shown that workers who return to work earlier have better health outcomes. Being engaged in work reduces focus and attention on pain. The reduction of focus on pain actually changes how the brain processes pain experiences. Self-redefinition – Chronic pain can lead to fundamental changes in how people see themselves and their lives. These changes affect how they feel. Fortunately, there are several new ideas around thinking, feeling and “being” – or acting – that can help people recognize and control what’s going on with their bodies. One in five Canadian adults suffers from chronic pain. 9.2% of patients on waitlists for treatment at Canadian pain clinics identify surgery as the cause of the chronic pain. Children are not spared. One in five Canadian children have weekly or more frequent chronic pains (most commonly headaches, stomachaches, and muscle/joint/backpain), with an estimated 5-8% of children or teenagers suffering from chronic pain severe enough that it interferes with schoolwork, social development, and physical activity. The prevalence of chronic pain increases with age with the prevalence of chronic pain as high as 65% in community dwelling seniors, and 80% of older adults living in long term care facilities, and this pain is underrecognized and undertreated. Chronic pain is associated with the worst quality of life as compared with other chronic diseases such as chronic lung or heart disease. US figures have documented that the cost of chronic pain in adults, including health care expenses and lost productivity is $560-630 billion annually. Based on these figures, it is estimated that the annual cost of chronic pain in Canada is at least $560 billion. People living with pain have double the risk of suicide as compared with people without chronic pain. Pain research is grossly under funded in Canada, with less than 1% of total funding from Canadian Institutes of Health Research, and only 0.25% of total funding for health research going to pain related studies, this is concerning especially when one considers the burden of pain on Canadians and our economy. Daniel, spending the first 10 days of his journey cycling on his own, will have moments of being lonely and solitary. People living with chronic pain experience a huge deal of being alone especially during the first years of their condition, with people even close to them finding it hard to understand what they are going through. This is not an easy trip to do — those who love Daniel will, of course, be worried for him. Chronic pain has never been an easy journey. Loved ones of those living with chronic pain are constantly concerned about what they are going through. Daniel will experience pain, and lots of it. Cycling across the world’s second largest country, which spans at least 6,000 kilometers, in only 55 days, is quite a feat that will be, by any standards, very enduring physically, mentally, and emotionally. People living with chronic pain experience the same, though a different kind of pain, and for an extended period of time — sometimes even their whole lives. Daniel will question the situation he is in. The physical pain will affect Daniel’s thoughts and emotions from time to time, making him question aspects of his journey. People living with chronic pain often wonder, get confused, and ask themselves why they are in the state they are in. Daniel has to take it one kilometer at a time. To succeed in this journey, Daniel will have to pace himself, and really take it one kilometer at a time. The journey is happening — he will have to take it gradually. For those living with chronic pain, adjusting to their condition takes time, patience, and gradual efforts — take it one step at a time, live day by day. Daniel will experience support, and plenty of it. Daniel has an enormous crowd cheering for him, from Canada and across the oceans. We all know he’ll make it. Likewise, individuals with chronic pain have a vast array of support, especially from chronic pain associations such as the Canadian Pain Coalition.